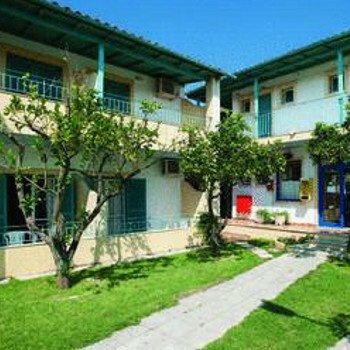 The Roussos has three blocks about 50m apart and naturally you can use the facilities in each. Located right on the beach. The room was in an excellent location with the three hotels right on top of each other it was always lively!Always noisy as well but to be expected from this type of holiday, it was very basic but was really only somewere to get changed and from what we seen of the hotel staff they were friendly. The location of the hotel is spot on, close to all of the bars and close enough to the beach. The staff are really friendly too but the rooms are a bit of a joke, if you went in the winter you'd be ok. You have to pay 50 euros for the week to have the air conditioning turned on in your room otherwise it is roasting at night and you can't sleep, and if you leave the doors open the mozzies help themselves to you. Pool area is really nice with music on during the day. Overall not a bad little hotel just a shame about the rooms. Kavos as a resort though is amazing we have been two years on the trot now and were all devastated to have to come home!!!!! Absolutely amazing holiday!! If you like sun, clubbing and cheap drinks involving little travelling this is the place to go! Me and my friends just got back yesterday and we honestly can't think of one bad thing to say about the holiday. Roussos and Odysesus basically merge into one hotel they are so close and if you get sick of the activity at Odyseus. Roussos' pool is fab looking out over the sea. Seriously recommend this place-you will love it!! Everything is on 1 street and Roussos, Odysesus and Agnes are in perfect location. Had no issues whatsover with cleaniless, nice rooms with balconies etc. Despite what people say, you can't smell sewage at all! This hotel was perfect.The location was really good.Brilliant during the day-very quiet, just what you need after the night before.The pool bar was excellent and Magda and Jenny are brilliant.They were really friendly and done everything possible to make your stay there a pleasant one.The security guard Spiros is a dodgy one so girls beware.Seriously we had to complain about him to our reps after a few things happened.He may not be there now as the manager said he would be sacked after we left.The cleaners come in every day and managed to make our room look decent.They made a good job of it everytime.You are told sheets are only changed once a week when in fact they are changed about four times a week.All in all this holiday was unbelievable and would definately go back.The best holiday ever by far.ps, extremely close to all the bars and clubs, making it easy to crawl home-perfect!